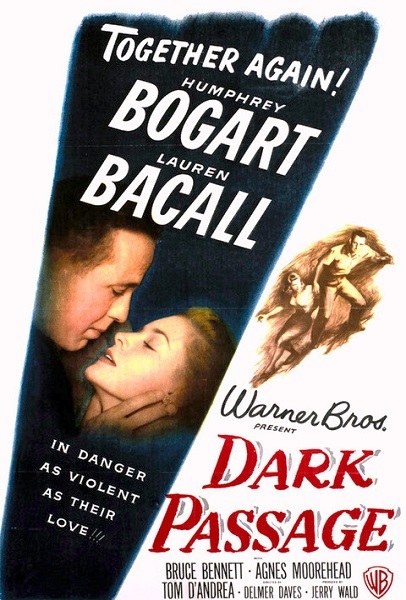 Corinne and Tim will have to start taking chances as they present their points-of-view on the odd film noir thriller Dark Passage from 1947. We'll discuss the chemistry between married co-stars Humphrey Bogart and Lauren Bacall as compared to their earlier collaborations, the use of first-person perspective in the movie, and the script's over-reliance on dubious coincidences. Warning: Contains spoilers, explicit language, and a distinct lack of evidence. Ever see a botched plastic surgery job? Do you enjoy painting scenic landscapes of prisons? Can you recommend a nice waterfront cafe in Peru? Leave a comment and keep the discussion going. Outstanding podcast. You correctly noted the similarity to The Fugitive. David Goodis, author of Dark Passage sued United Artists for pirating his theme for The Fugitive. See my website for the full story. That's a really interesting tidbit that I missed. A pity Goodis died before the resolution of the case. Would you mind if I post this link in the supplemental material for the episode? Please post my comments. Thank you, Tim.